Jerry Marvel was born on June 12, 1933, in Grayville, Illinois. He entered the Naval Aviation Cadet program on September 11, 1954, and was commissioned a 2d Lt in the U.S. Marine Corps and designated a Naval Aviator on May 1, 1956. Lt Marvel flew HRS-3 and H-34 helicopters with HMR-361 at MCAF Santa Ana, California, from June 1956 to November 1961, and then with HMR-163 at MCAF Santa Ana from November 1961 to February 1962. He then deployed to South Vietnam with HMR-163 from February 1962 to August 1963. Capt Marvel returned to NAS Pensacola in October 1963 for fixed-wing pilot upgrade training, and completed fixed-wing flight school at NAS Corpus Christi, Texas, in December 1964. 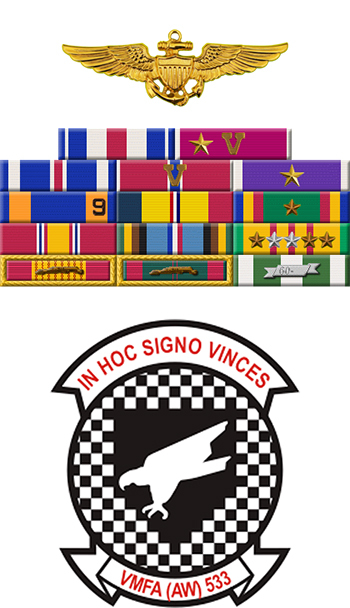 After completing A-6 Intruder training, Capt Marvel was assigned to VMA-225 at MCAS Cherry Point, North Carolina, from October 1965 to November 1967, followed by service with VMA(AW)-533 of Marine Air Group 12 flying out of Chu Lai, South Vietnam, from December 1967 until he was forced to eject over North Vietnam and was taken as a Prisoner of War on February 24, 1968. After spending 1,846 days in captivity, Col Marvel was released during Operation Homecoming on March 14, 1973. He was briefly hospitalized to recover from his injuries and then returned to flying status as an instructor pilot until September 1975, when he attended a college degree program. Col Marvel served as Director of Training and Education at MCAS Cherry Point, then as Director of Manpower, followed by service as Executive Officer and then Commanding Officer of VMAT-202 from April 1977 to May 1980. He next served as Commanding Officer of MCAS New River, North Carolina, from May 1980 until his retirement from the Marine Corps on July 1, 1983. 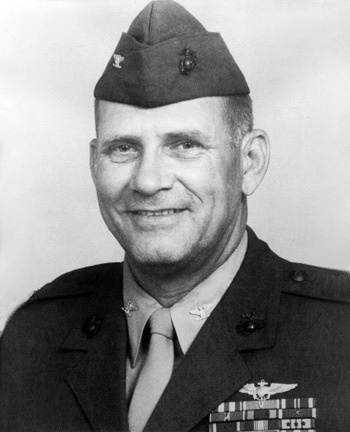 After his retirement, Jerry served as Director of Training and Education at MCAS Cherry Point in a civilian capacity from 1985 until his death on May 27, 1995. Jerry Marvel was buried at the New Bern National Cemetery in New Bern, North Carolina. For conspicuous gallantry and intrepidity while interned as a Prisoner of War (POW) in Southeast Asia from February 1968 to August 1969. Refusing to cooperate with the enemy who resorted to severe cruelties, Lieutenant Colonel (then Major) Marvel resisted all attempts by his captors to compromise his rigid adherence to the Code of Conduct. As a result of his participation in an intracamp communications system, he was placed in solitary confinement, yet he never deterred from performing effectively in a viable leadership capacity. By his steadfast resistance, Lieutenant Colonel Marvel brought about an increased intensity in the mistreatment received. His leadership by example and dogged resistance served as an inspiration to other POW's, thus frustrating the attempts of his captors to attain any degree of dominance over them. By his deep sense of devotion to the United States and his fellow POW's, Lieutenant Colonel Marvel reflected great credit upon himself, the Marine Corps, and the United States Naval Service.